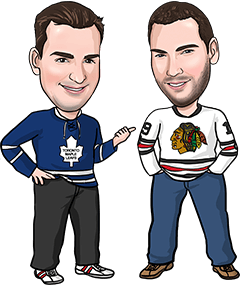 We split our Best Bets yesterday with the Kings blowing out the Leafs 7-0 but the Rangers mailing it in in a 5-3 loss to the Canucks. The leans enjoyed another solid night, going 5-2 for approximately +3 units if you played them all. We certainly don’t recommend you bet all the leans, but hopefully you’ll find a few that agree with what you were already thinking on a game and it’ll help you pull the trigger on those. There are just 3 games in the NHL tonight. Our favourite bet of the night is in the Ducks/Blue Jackets matchup, and we’ve got leans on the Senators/Sabres and Blackhawks/Blues contests as well. Last night, we liked the Kings because they were in a nice situational spot: playing the first game of a road trip with the momentum of having won a couple of games at home. Anaheim’s in the same situation here, having beaten Calgary and Arizona by a combined score of 9-2 in its last 2 games and now setting out on an east coast trip. The Ducks have limited opponents to 1 goal or less in 3 of their last 4 games, and 4 of their last 6. Their power play is clicking right now as well, going 6 for its last 12 and 9 for its last 20. Columbus got everyone’s attention with that 10-0 rout of Montreal Friday night, and the Jackets have been playing some good hockey lately, collecting points in 7 of their last 8 games. But they’re without one of their top D tonight in Seth Jones, and the Ducks should be bringing their A game tonight looking to avenge a 4-0 loss to the Blue Jackets Oct. 28 in Anaheim. We like the Ducks as a short road favourite tonight. Reasons to bet Ottawa: Even after a 3-1 loss in Nashville last night, the Senators have allowed just 6 goals in their last 5 games. Ottawa has not surrendered a power play goal in its last 7 contests. The Sabres have scored just 3 goals in their last 3 games, and 5 in their last 4. Reasons to bet Buffalo: Monday’s 4-0 loss in Boston marked the first time in 6 games that the Sabres have allowed more than 2 goals to an opponent. Three of those goals were power-play goals, so Buffalo still appears to be playing very well defensively at even strength. The Sens have managed just 1 goal in each of their last 3 games, and 9 goals in their last 6. Reasons to bet Chicago: The Blackhawks are the hottest team in the NHL right now, winners of 6 straight. The Blackhawks have earned points in 8 straight games (7-0-1) and have scored 3 goals or more in 6 consecutive games. Prior to a 5-1 win over Colorado Sunday, St. Louis had scored just 7 goals in its previous 6 games. Reasons to bet St. Louis: The Blues have won 2 straight after winning just twice in their previous eight (2-4-2). St. Louis has allowed just 2 goals in its last 2 games. The Blues are 5-1-0-1 at home this year, while the Blackhawks are just 2-2 on the road.